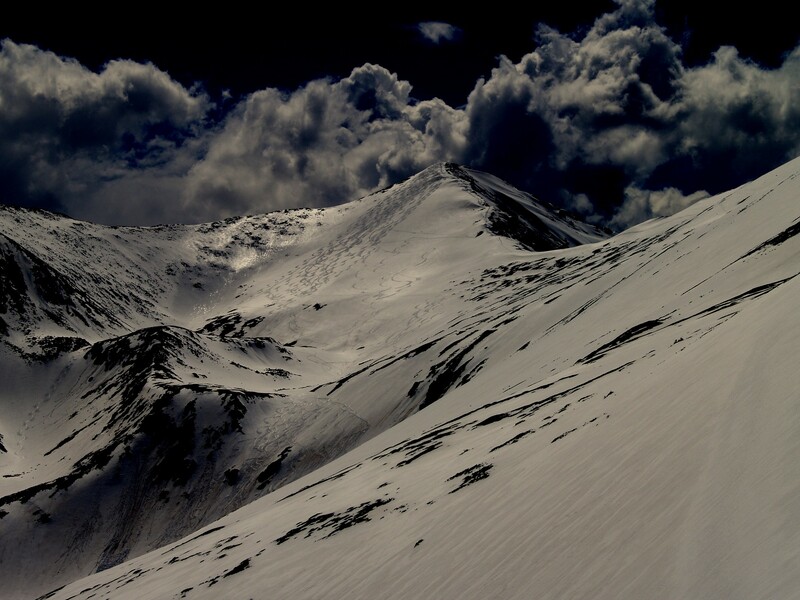 Crystal Peak is the 82nd highest peak in the state, coming in at 13,852' and is located in the Arapahoe National Forest, Southwest of Breckenridge. The peak offers 4 faces, of which 3 are ofen skied. The access to this area offers some great descents, as well as come gorgeous views. While the peak is a 7 mile trip, the route is easy to follow, as it winds up through the ten-mile using old jeep trails. The east face is a more mellow slope, where as the north face is a bit more challenging and technical. This peak offers access to a number of other areas, and can be skied in stable winter conditions, or in spring. Depending on the year, the snow will be skiiable until Early June, but you will want to get off early due to the willows down low that will bog you down. From the south end of Breckenridge, drive 2 miles south on Colorado 9. Turn right on Spruce Creek Road. This intersection is about 2.4 miles outside of town. There is a sign here that says "The Crown". Stay right up a small hill and then left at an intersection. There are several side roads in this area. Stay on the main road and drive 1.2 miles (from Highway 9) to the Spruce Creek trailhead at 10,400'. There is a large parking area here. This trailhead is accessible in Winter. A 4x4 road will continue past the main trailhead, but 4x4 clearance is recommended. The road is an easy skin or hike. There is a hut in this basin, Francie's Hut. The town of Breckenridge will give you anything you need, including restaurants, bars, and grocery stores. There is limited motorized access to this peak, due to the fact that is is in a national forest.